The pokies aren’t just about lining up symbols to form a winning combination, you can also win extra money and enhance your gaming experience thanks to the inclusion of heaps of different bonuses and special features. Playing online gives you access to many more bonus features than you’ll find within land based pokie machines, read on to find out more about what pokies features are available and how they can increase your winning potential. 243, 1024, 3125 Ways – this refers to the number of possible winning combinations within a single game. For example, if you’re playing a 243 ways pokies game or 1024 ways pokies game, this means there are 243 ways or 1024 potential ways, respectively, you can win during each spin. These are sometimes referred to as “All Ways” pokies. Collapsing reels – also known as cascading reels, these are reels what will collapse upon a winning spin in order for new symbols to fall into place and potentially create another win. This feature allows you to win multiple times for the price of a single spin. Expanding wilds – wild symbols can expand across the reels in order to create even more winning combinations across other paylines. Free spins – free spins give you a chance to spin the reels and take any winnings without any impact on your bankroll. The winning potential also increases in many video pokies games during free spin bonuses. Gamble – similar to the gamble feature you’ll find in some real life pokies, the gamble option can be activated after a winning spin if you want to bet your winnings on the colour or suit of a face down card in order to double your prize. MegaSpin pokies – these are multi-play games, where you can play up to nine separate pokies games at once, all within the one webpage. Good for those who like to multi-task, but with an individual wager required for each game, MegaSpin pokies are an easy way to burn through your money at a rapid pace. Mini games – unique bonus games which take you to a separate screen to enjoy all kinds of arcade style games, adventure games, puzzle games and whatever unique creations the software developers can come up with. Multipliers – multipliers give you a boost on your win, and usually come in 1X, 2X, 3X, 4X or 5X. For example, if you score a 3X multiplier, this means any amount you win during said spin will be tripled. Progressive jackpots – these are massive pokies jackpots games which increase whenever a player places a real money bet on the same game anywhere within the linked network. Scatters – scatter symbols hold the power to activate certain bonus features within a game, usually responsible for triggering free spins. Sticky wilds – wild symbols held in place for the duration of the next spin (or multiple spins) in order to increase your chances of a winning wild combination. Wilds – wild symbols have strong winning potential and can trigger some bonus features. Wilds usually substitute all other symbols to form a winning combination, excluding the scatter symbol. What are the best features for biggest payouts? If the big payouts are what you’re searching for, then progressive jackpot games are your best bet. Progressives from big name software developers like Microgaming and NetEnt carry jackpots starting at around the one-million-dollar mark, and have been known to produce winnings of upwards of $15 million from one spin. While other pokies features like free spins and wild bonuses can earn you some good winnings, progressive jackpots have the potential to be truly life changing. Gonzo’s Quest – experience the phenomenon of avalanche symbols, with a Free Falls bonus causing an avalanche of wins to begin. The Slotfather – this 3D pokies game features multiple bonuses including a progressive jackpot, free spins with multipliers, a random instant win bonus and a mini bonus game. Mega Moolah – trigger the jackpot wheel to win one of four massive progressive jackpots. Avalon II – this game includes a choose-your-own-adventure style bonus feature, with one of the biggest selections of bonus games we’ve seen. 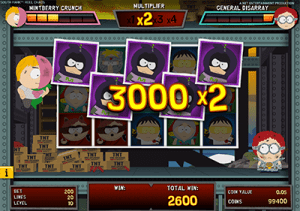 South Park Reel Chaos – along with stacked wilds, multipliers and re-spins, trigger the Mintberry Crunch Epic Bonus game to fight enemies and receive a bonus for your victories. Immortal Romance – this Twilight-inspired pokies game includes the Chamber of Spins bonus feature, where you get to select one of four bonus games to win a different number of free spins with multipliers of varying value. All sites listed in the casino table at the top of this page are geo-targeted to your location and dynamically updates whenever there is a change, meaning it only lists offshore online casino websites currently servicing Australian players legally. Sign up for an account at any of these casinos and make an AUD deposit to receive bonus credits and free spins to experience the full range of real money pokies available for both desktop and mobile play.